From the west take the Thruway to the Amsterdam exit (exit 27) and then take route 30 north about 10 miles more or less until you get to route 29. Turn right on route 29 and go exactly 10.6 miles to Barkersville Road and turn left. Go 2.9 miles on Barkersville road to 7272 Barkersville road on the right, that's Hyzer Creek.When going through downtown Barkersville, make sure you bear right at the fork. From the west you can also take the Fultonville Fonda exit (exit 28) and get on 29 east there. Barkersville Road is 10.6 miles past the intersection of route 30 and 29. From the south take the Thruway north to exit 24 Albany, and continue on 87 north (the Northway) from there. Take exit 13 N at Saratoga, and go 3 miles north on rt 9 to downtown Saratoga Springs. In downtown, at Starbucks, turn left onto Route 29 and go 12.9 miles west to Barkersville Road, turn right and go 2.9 miles to 7272 Barkersville Rd that's Hyzer Creek.When going through downtown Barkersville, make sure you bear right at the fork. From the north take 87 south to exit 15, go to downtown Saratoga Springs and turn right at Starbucks onto rt 29. Go 12.9 miles west to Barkersville Road, turn right and go 2.9 miles to 7272 Barkersville Rd that's Hyzer Creek.When going through downtown Barkersville, make sure you bear right at the fork. 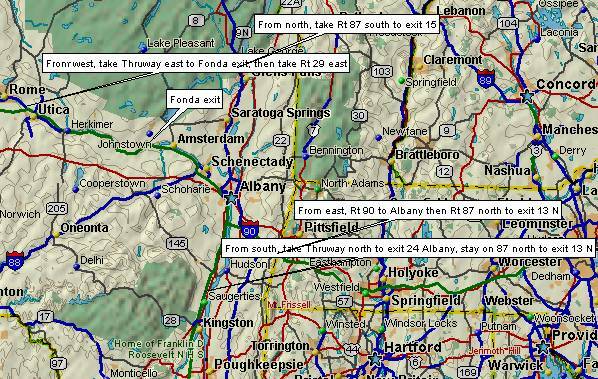 From the east take the Mass Pike to Albany and get on 87 north (the Northway). Take exit 13 N at Saratoga, and go 3 miles north on rt 9 to downtown Saratoga Springs. In downtown, at Starbucks, turn left onto Route 29 and go 12.9 miles west to Barkersville Road, turn right and go 2.9 miles to 7272 Barkersville Rd that's Hyzer Creek.When going through downtown Barkersville, make sure you bear right at the fork.